“Did you do this?” they demanded. Though I struggled to confirm the details of that story, the essential points remain true: the painting Guernica reflects the bombing of the place of the same name in northwest Spain. The bombs came delivered by the Nazis (with Italian military support) to help Franco win the Spanish Civil War. The military dictatorship that followed continued in Spain through the Swinging Sixties and Punk Seventies elsewhere until the death of Franco himself in 1975. And I recognised the picture, the jagged, ragged, displaced screams and torment of black, grey and white, women’s breasts, blood, babies and bulls. But standing right before it, in the Reina Sofia in Madrid was another thing altogether. The work is vast, which is the first surprise, as it sprawls from left to right and up and down across a purpose built wall. The Reina Sofia itself carries both a surreal beauty and a sense of unease, explained in part, I think, by its former role as a hospital with the rumoured ghosts that flit between the halls. It follows the decomposition (I’m sure that’s not the word but perhaps it should be) of art once photography arrived. Once photography completely subsumed the role of producing lifelike images, what was an artist to do but slide into impressionism, cubism, those funny grids and blank panels and then finally abandon 2D art altogether? Since we can’t yet be teleported into an environment, how else to depict it? Moving pictures and words can do their best. So can photography and stills. But it’s the arrival of 3D installations that appear to offer something new. They’re not necessarily beautiful (nor even, in many cases, that interesting) but every now and then, they do provoke a thought or two and I suppose that that’s the main thing. Meanwhile, back in room 206, the crowd still stares at Guernica. It’s a compelling, captivating piece of work. But for me, the most interesting part lives behind it – and beyond it. Behind it, the museum exhibits the rough sketches, the drawings, the, let’s face it, rubbish first drafts that fascinate me more. Here is the slightest glimpse at the inner workings of a genius – and it’s a glimpse that should give us all hope. It reveals not unthinkable, unworkable majesty, but the plottings and pressures of a man under a deadline. It echoes my thoughts on Toulouse-Lautrec, poster boy of Moulin Rouge fame, when I wrote about the secrets of success. And I am grateful to both the museum and to Picasso for letting us witness these embryonic forms. So that’s what lies immediately behind Guernica. Further behind still are the facts and interpretations about this real life event. How between 150 and 1600 men, women and children were killed over a period of hours. How this was one of, if not the first act of aggression whereby military planes rained down on civilians. There’s the legend, in case, like me, you didn’t already know. Picasso vowed that his most famous work should never travel to Spain until democracy was restored. He died in 1973, Franco in 1975. Guernica reached Madrid in 1981. The crowds, they thronged and waited. And today they are thronging still. 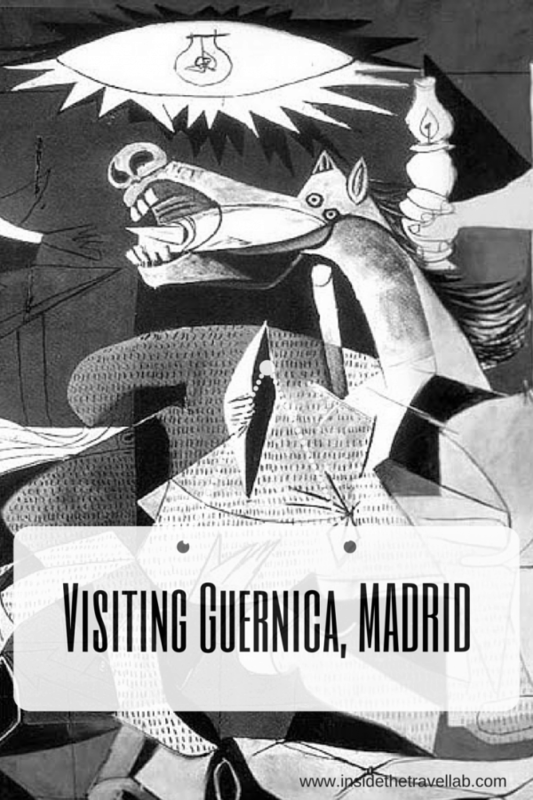 Have you seen Guernica or any other art in Madrid? Would you want to? Did you already know the legend? I can’t tell you how much I enjoyed reading this, and how much I wish I’d been blogging in 2002 when I first saw the Guernica. I am not knowledgeable when it comes to art, but only one other work ever took away my breath the way this did (MichaelAngelo’s La Pieta). I knew the history, but saw those rough sketches first, and so was thinking that perhaps I’d built it up in my mind to be more than it was, especially since Picasso’s work often puzzles me. How wrong I was. I stood transfixed for a long time, trying, in vain of course, to take it all in. Your experience brought it all back thank you. Oh, thank you for this comment! It’s what blogging is all about :-) I, too, was very excited to finally see it – and a little surprised. I’m not too fond of the general style and am always a bit wary about seeing “masterpieces” in case, like the Mona Lisa at the Louvre, it’s all queue and no wow! But seeing this – and David in Florence – made me feel both inspired and privileged. And humble. When I saw Guernica, I remember standing transfixed for over 30 minutes. The scale of it surprised me too, and the emotion I felt, well, even years later it still feels raw. My favourite Picasso painting, by far. Sadly, I have not been to Madrid yet, but will definitely check this out once I make that much-needed trek! And yet you’ve travelled to so many places?! Interesting, how often the big cities seem to get missed. I’m guessing you’ll love Madrid – loads of culture both established and quirky. A great city. Luckily, I saw Guernica as part of a special art exhibit of Picasso, Goya and Dali works held in the southern town of Wroclaw, Poland, last summer. I didn’t fully comprehend Picasso’s work then until I read Guernica: A Novel by Dave Bohling. It’s a fantastic, historical fiction book that really explains the people that lived in Guernica and their lives. Then, we traveled through Basque country last month and then Guernica really hit home for me. I cannot understand how Franco and the Germans could basically want to wipe out the Basque people. Horrible! Ah, that’s really interesting to hear. I’ll make a note of the book and add it to my (admittedly long!) list of things to read. The Basque country is beautiful – but it is utterly beyond me why anyone would want to wipe out an entire group of people. Or why such attempts keep appearing throughout history. Perhaps that’s what makes Guernica SOooo moving. It takes you to Guernica but also beyond – to all the other massacres that have taken and will take place. I saw Guernica in Madrid a couple of years ago and I was awe-struck to see it in person, but I was also shocked by how much security they had around it. It almost outshone the painting itself which was a bit of a disappointment! Still, I loved the experience and it’s always amazing to see a painting you love in person. Oh no, what a shame! I didn’t particularly notice the security setup (other than you’re not allowed to take photos – even with pre-arranged press access!) Perhaps you were unlucky that day…(or perhaps I was blissfully unaware.) Shame. I wish I would have seen this when I was in Madrid. Fortunately, I am back in Madrid in two weeks and can go. Reina Sofia is one of my most favorite museums! Ooh – enjoy! Have some churros n chocolate for me would you? Mmmmm….Perfect for winter too. I’m not a huge fan of art museums in general, but cubism is one of the few movements that I appreciate. Great photos! I’m either hot or cold about them. This one was great but you could easily get lost (both literally and metaphorically) as it’s just so vast. The Guernica is indeed a wonderful piece of art, with a sad legend / story. I knew the story and I have been to Guernica in the north of Spain (still a beautiful town). Worth visiting for every tourist going to Madrid! What is Guernica like now? Are there memorials or has life continued as normal as far as you can tell on the outside? I did not know the legend behind Guernica, but I’m fascinated! This is something I absolutely plan to explore more when I reach Spain (finally!) later this year. You’re going to have so much to enjoy when you get to Spain. Its culture is so rich – and the food and the weather’s pretty good too! Guernica is a work I would love to see–it’s not beautiful but is such a strong piece in the history of modern art. And the art that’s available for view in Spain is reason enough to travel to that country, if you ask me. I haven’t been to Madrid but will enjoy the museums when I do get there. When I was in Madrid two years ago, I visited the Reina Sofia Museum on several occasions and each time I would go straight to the The Guernica. There’s something about the painting that stirs the emotion. Next time I’m in Madrid guess where I’ll head back again?